Like me, you may have received an e-mail with one or more of these photos that misattributes the location and exaggerates the size of the alligator. With the help of Snopes.com, I have sorted out the circumstances and provide the correct captions below. 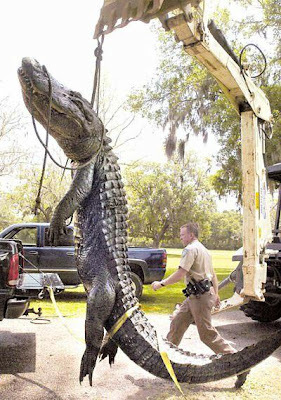 This 13' 1" alligator was shot and killed by game wardens near West Columbia, Texas, in 2005. The photo was taken by Val Horvath for a local newspaper and exaggerates the size of the animal by placing it in the foreground. 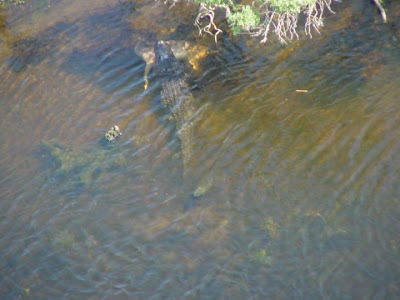 This photograph of a 12' to 13' alligator with a deer in its jaws was taken from the air in 2004 by Terri Jenkins, a U.S. Wildlife Service District Fire Management Officer on her way to ignite a prescribed fire at Harris Neck Wildlife Refuge, south of Savannah, Georgia. 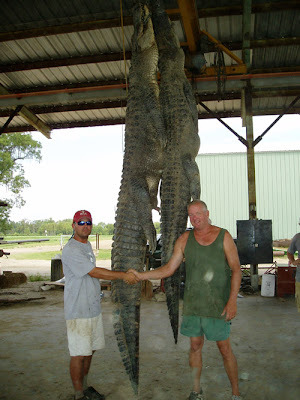 This photo shows 2 alligators caught by Glenn Capdepon and Brandon Jackson in Louisiana in 2006. 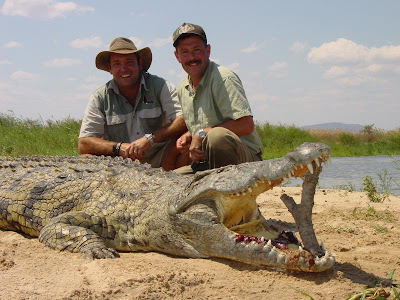 The alligator on the left, which had been released into the wild at 44" in 1993, grew to 12' 6". 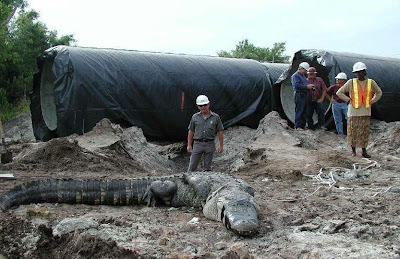 The alligator in this photograph, again probably exaggerated in size by its placement in the foreground, was taken at an unknown construction site, where workers often encounter the native inhabitants. It does not, however, depict a Florida Power & Light crew, as attributed in urban legend. This widely circulated image was taken in the Florida Everglades in 2005 and shows the tail of a 6' alligator protruding from the burst midsection of a 13' Burmese python. 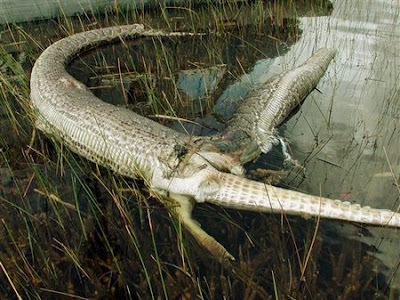 Both animals were found dead and the snake's head was missing, so it may have been eaten by scavengers after the gases of the alligator's decomposition caused it to rupture or the snake's head may have been cut off and its body cut open by a human predator. 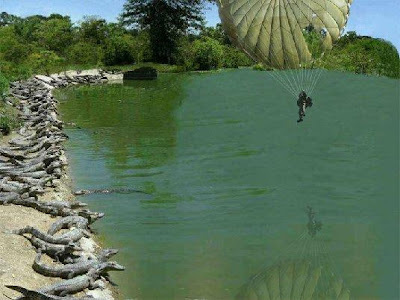 This photoshopped image mimics a Far Side cartoon by adding a parachutist to a photo identified as a Louisiana alligator farm. Click on this photo (caution) for details about how the animal - actually a Nile crocodile - purportedly contained the remains of a Florida man killed by a 9' alligator while fleeing from the police in 2007. Many of these urban legends claim the alligators in question were in excess of 25' long. Note that the world's longest alligator - caught in Marsh Island, Louisiana, in 1890 - measured 19' 2".